There exists, as there often does, 2 sides of user interface design. One is the side that hopefully most of us are acquainted with, a side that has the best interest of the user at heart. We strive to make things easy and intuitive for our users, to shepherd them through unfamiliar processes with minimal effort. In doing this, user experience professionals follow good design “patterns.” These concepts are essentially best practices for user interface design. They use established user data to create interfaces that are easy to follow, and most importantly – honest. Ignoring these, you can find yourself in the land of “anti-patterns” or practices that can confuse and bewilder a user. These are usually just mistakes and development versus any kind of out and out malignancy. But, there also exist “Dark Patterns;” patterns that are used with just as much (if not more) thought but not toward a user’s benefit. Instead these tricks, cheats, and charlatans would con the user into signing up for things they don’t want, buy services they don’t need, and agreeing to things they never would otherwise do. Let me be your Defense Against The Dark Arts instructor as we take a look at some common Dark Pattern um…patterns. The first is so common it seems like most just accept that it’s how the internet works. It’s the “enabled checkbox” dark pattern. Tucked into things you usually would check like “create a desktop icon” or “create a start menu icon” there will be an invitation to “Download the NotMalwareWeSuperPromise Toolbar.” Users don’t want this toolbar. No one wants this toolbar. Why is it there? And furthermore why is it checked? If the person who had designed the UI had the user’s best interest at heart, he would have realized the user wanted the product he downloaded, and not a totally unrelated one. It’s disingenuous at best and downright dirty at worst. It’s present in websites as well. When signing up for a site you will often find the options for signing up for the newsletter, the “sure, I want ‘value added’ emails”, and “Some other entity you’re not telling me the name of wants to send me spam too? SIGN ME UP!” checkboxes already filled in. Thanks but no thanks, Internet. These options exist simply to trick a user to agree to things he doesn’t want to. 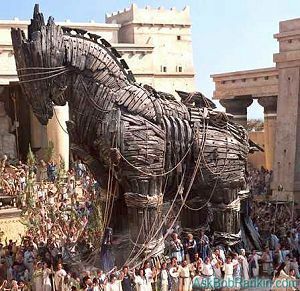 I see you want this bit of freeware, could I interest you in this totally harmless horse statue as well? At Next.Co.Uk, the user has a litany of questions he or she must muddle through in order to complete their order. Say the user plays their shell game and wants to save 25 cents and get free delivery. 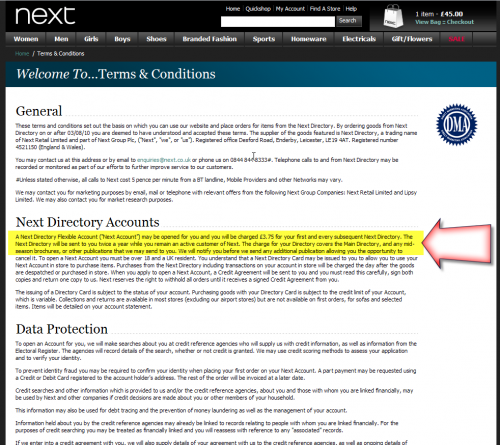 The Terms and Conditions, which only 7% of users read, lets the user know that he or she has just signed up for a subscription to the Next Catalog. You’re welcome, user. Like Hotel California, some services on the web let you check in buy never leave. 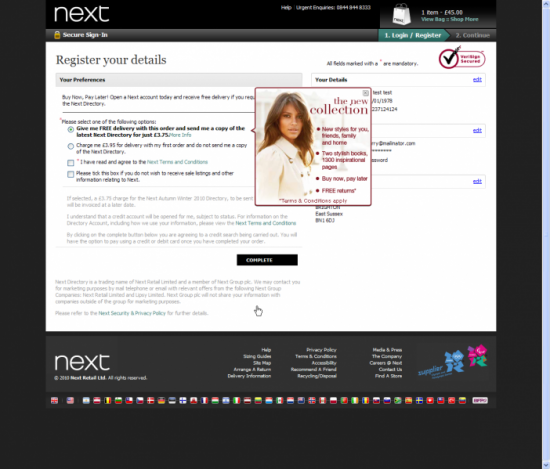 Signing up for a service is easy on some sites, sometimes too easy. But once a user is tired of an inbox crammed with a newsletter that is no longer relevant to their interests, alongside all the spam they inadvertently signed up for, getting out seems like a game of hide and seek. 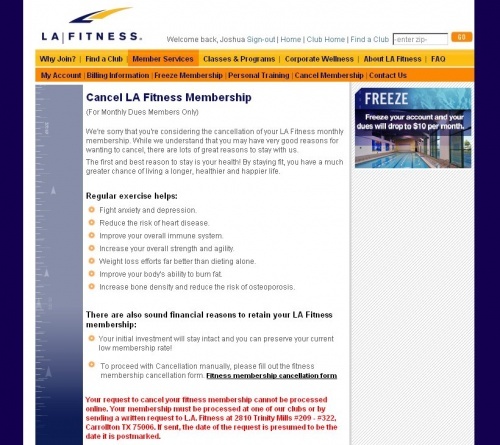 LA Fitness (full disclosure – I totally fell for this one) lets you sign up for their memberships online. It’s super easy to do. Don’t want to be a member anymore? Well apparently, while they have the technology to allow you to join their service, they have to use analog mail to let you quit. That’s right, you can sign up online but have to use stamp and paper to get out. These tricks and tactics provide great short term rewards for their practitioners. I’m still a member of LA Fitness. Not because I like how I was treated, but because I’m too lazy to quit. They got me. It’s easy to catch people off guard on the internet, a world of small print and shady tactics. You have to stay on guard to keep your wallet secure, your inbox clear, and your computer bloatware free. And if you’re a UI/UX professional, really think twice about a tactic if it is going to do anything but help your brand in the long run.